2018. Oxford University Press. Oxford. This book develops a novel multilevel social contract theory that, in contrast to existing theories in the liberal tradition, does not merely assume a restricted form of reasonable moral pluralism, but is tailored to the conditions of deeply morally pluralistic societies which may be populated by liberal moral agents, nonliberal moral agents, and, according to the traditional understanding of morality, nonmoral agents alike. The book draws on the history of the social contract tradition, especially the work of Hobbes, Hume, Kant, Rawls, and Gauthier, as well as on the work of some of the critics of this tradition, such as Sen and Gaus. The two-level contractarian theory holds that morality in its best contractarian version for the conditions of deeply morally pluralistic societies entails Humean, Hobbesian, and Kantian moral properties. The theory defines the minimal behavioral restrictions that are necessary to ensure, compared to violent conflict resolution, mutually beneficial peaceful long-term cooperation in deeply morally pluralistic societies. The theory minimizes the problem of compliance for morally diverse societies by maximally respecting the interests of all members of society. Despite its ideal nature, the theory is, in principle, applicable to the real world and, for the conditions described, most promising for securing mutually beneficial peaceful long-term cooperation in a world in which a fully just society, due to moral diversity, is unattainable. If Rawls’ intention was to carry the traditional social contract argument to a higher level of abstraction, then the two-level contractarian theory brings it back down to earth. Forthcoming. In Ben Eggleston and Dale E. Miller (eds. ), Moral Theory and Climate Change: Ethical Perspectives on a Warming Planet (Routledge). Contemporary moral contractarianism originates with Hobbes’s moral theory. When considering the structure of Hobbes’s moral theory, however, it is often argued that moral contractarianism does not justify any specific moral demands concerning questions of climate change because currently no global Leviathan in Hobbes’s sense exists that could enforce any such demands in our world. I do not dispute the fact that currently no global Leviathan in Hobbes’s sense exists in our world. Nevertheless, I argue that Hobbesian moral contractarianism offers an adequate moral framework to guide our considerations concerning questions of climate change. Methodologically, the approach is sufficiently pluralistic to consider ethical and economic considerations as well as political feasibility constraints. Conceptually, I argue that, despite the fact that currently no global Leviathan in Hobbes’s sense exists in our world, a Hobbesian-inspired modus vivendi is sufficient as a starting point to address some of the most pressing issues of climate change in our world. Specifically, I argue that the shift in climate change negotiations from the Kyoto Protocol to the Paris Agreement could be considered to be guided by reasoning that underlies Hobbesian moral contractarianism. The topic of moral diversity is not only prevalent in contemporary moral and political philosophy, it is also practically relevant. Moral diversity, however, poses a significant challenge for moral theory building. John Thrasher (Synthese, forthcoming), in his discussion of public reason theory, which includes social contract theory, argues that if one seriously considers the goal of moral constructivism and considerations of representation and stability, then moral diversity poses an insurmountable problem for most public reason theories. I agree with Thrasher that moral diversity poses a significant challenge for orthodox multistage social contract theories. In fact, I even add a further problem for such theories under the assumption of deep moral diversity. Nevertheless, I argue that my (Moehler, Minimal morality: a multilevel social contract theory, Oxford University Press, Oxford, 2018) recently developed multilevel social contract theory overcomes these problems. I focus on some of the underexplored features of this theory to show that multilevel social contract theory offers one conceptually coherent and plausible way to render social contract theory viable and relevant for modern diverse societies. 2019. Analysis 79 (1): 140-153. 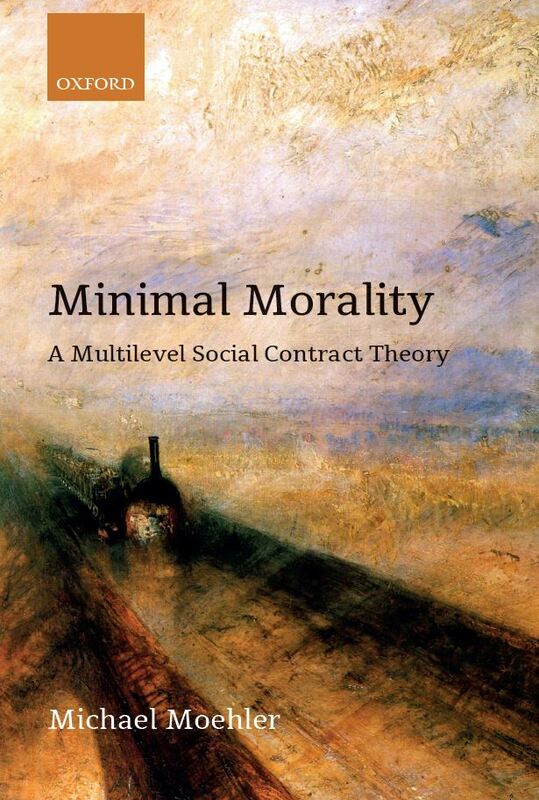 In Minimal Morality (2018), I develop a multilevel social contract theory that accommodates deep moral pluralism. In this article, I reply to comments by Gaus, Van Schoelandt and Cooper concerning the three core projects of the book that aim to (i) revive orthodox rational choice contractarianism as a viable approach to the social contract, (ii) integrate this approach into a comprehensive social contract theory and (iii) show the applicability of the theory to the real world. My replies clarify some of the main features of the theory, defend its core projects and expand discussion of some of its details in order to show that the theory can address the challenges raised. 2018. Pacific Philosophical Quarterly 99 (1): 82-99. Central to the Rawls–Harsanyi dispute is the question of whether the core modeling device of Rawls’ theory of justice, the original position, justifies Rawls’ principles of justice, as Rawls suggests, or whether it justifies the average utility principle, as Harsanyi suggests. Many commentators agree with Harsanyi and consider this dispute to be primarily about the correct application of normative decision theory to Rawls’ original position. I argue that, if adequately conceived, the Rawls–Harsanyi dispute is not primarily a dispute about the correct application of normative decision theory to Rawls’ original position. Instead, Rawls and Harsanyi aim to model different moral ideals, and this difference in their moral assumptions leads them to significantly different conclusions about justice. There is no winner in the Rawls–Harsanyi dispute. Instead, the dispute merely clarifies the moral ideals and their formal representations that need to be assumed in order to justify either Rawls’ contractualist principles of justice or the average utility principle. Thus understood, the Rawls–Harsanyi dispute offers a promising starting point for future research that can deepen and enrich our understanding of the demands of justice. 2017. European Journal of Philosophy 25 (2): 416-439. In this article, I defend a democratic form of the productivist welfare state. I argue that this form of the state can best cope, theoretically and practically, with the diversity of deeply morally pluralistic democratic societies for two reasons. First, the justification of this form of the state rests solely on general facts about human nature, basic human needs, and efficiency considerations in a world of moderately scarce resources. Second, this state does not aim to promote a specific view of justice, but human flourishing more generally, expressed in terms of individual and collective productivity. The proposed democratic productivist welfare state supports its citizens up to the level that allows them to develop and exercise their talents and abilities without providing incentives for free riding. I argue that, under the specific empirical circumstances that I describe, in particular certain informational restrictions concerning the precise productive and destructive capacities of the members of society in practice and the soundness of the Aristotelian principle, this goal may best be achieved in practice by the introduction of an unconditional basic income at subsistence level, if society is sufficiently developed economically to provide such an income. On productivist grounds, such an unconditional subsistence income also addresses, pragmatically and partially, the problem of historical injustices against the weakest members of society and provides all group members with the means for democratic participation. 2016. Journal of Social Philosophy 47 (3): 350-367. In this article, I defend the veil of ignorance against the objection that the device is inadequate for deriving demands of justice, because the veil of ignorance purportedly enforces a stronger form of impartiality than Kant’s categorical imperative and, primarily as a consequence, it generally leads to non-prioritarian conclusions. I show that the moral ideal of impartiality that is expressed by the veil of ignorance is not essentially different from Kant’s notion of impartiality and that it does not generally lead to non-prioritarian conclusions. Although the moral ideal of impartiality that is modeled by the veil of ignorance demands solid justification for favoring particular positions of society, it generally does not rule out prioritarianism. Rather, the non-prioritarian conclusions reached by many theories of justice that rely on veil of ignorance reasoning are a result of the complex structures of these theories and the way that they combine and weigh different moral ideals, as well as their informational bases. 2016. Politics, Philosophy and Economics 15 (2): 113–131. In a recent article, Gauthier (2013) rejects orthodox rational choice contractarianism in favor of a revisionist approach to the social contract that, according to him, justifies his principle of maximin proportionate gain (formerly the principle of minimax relative concession or maximin relative benefit) as a principle of distributive justice. I agree with Gauthier that his principle of maximin proportionate gain cannot be justified by orthodox rational choice contractarianism. I argue, however, that orthodox rational choice contractarianism, before and after Gauthier, is still a viable approach to the social contract, although the scope of this approach is limited. Orthodox rational choice contractarianism can be applied fruitfully to moral philosophy only in situations of deep moral pluralism in which moral reasoning is reduced to instrumental reasoning, because the members of society do not share, as assumed by traditional moral theories, a consensus on moral ideals as traditionally conceived as a starting point for the derivation of moral rules, but only an overarching end that they aim to reach. If orthodox rational choice contractarianism is applied adequately, then it offers a viable approach to the social contract that, in contrast to Gauthier’s theory, justifies a rival principle for distributive conflicts that is valid for deeply morally pluralistic societies. 2015. Ethical Theory and Moral Practice 18 (3): 577-594. In a recent article, McClennen (2012) defends an alternative bargaining theory in response to his criticisms of the standard Nash bargaining solution as a principle of distributive justice in the context of the social contract. McClennen rejects the orthodox concept of expected individual utility maximizing behavior that underlies the Nash bargaining model in favor of what he calls full rationality, and McClennen’s full cooperation bargaining theory demands that agents select the most egalitarian strictly Pareto-optimal distributional outcome that is strictly Pareto-superior to the state of nature. I argue that McClennen’s full cooperators are best described as reasonable agents whose rationality is constrained by moral considerations and that McClennen’s bargaining theory is moralized in this regard. If, by contrast, the orthodox concept of rationality is assumed and plausible assumptions are made about human nature and social cooperation, then a modified version of the standard Nash bargaining solution, which I call the stabilized Nash bargaining solution (Moehler 2010), is justified. From the perspective of rational agents, the stabilized Nash bargaining solution can accommodate McClennen’s criticisms of the standard Nash bargaining solution in the context of the social contract and, for such agents, it can serve as a principle of distributive justice in deeply morally pluralistic societies. 2014. Philosophical Studies 167 (2): 431-451. In The Order of Public Reason (2011), Gerald Gaus rejects the instrumental approach to morality as a viable account of social morality. Gaus’ rejection of the instrumental approach to morality, and his own moral theory, raise important foundational questions concerning the adequate scope of instrumental morality. In this article, I address some of these questions and I argue that Gaus’ rejection of the instrumental approach to morality stems primarily from a common but inadequate application of this approach. The scope of instrumental morality, and especially the scope of pure moral instrumentalism, is limited. The purely instrumental approach to morality can be applied fruitfully to moral philosophy only in situations of extreme pluralism in which moral reasoning is reduced to instrumental reasoning, because the members of a society do not share, as assumed by traditional moral theories, a consensus on moral ideals as a basis for the derivation of social moral rules, but only an end that they aim to reach. Based on this understanding, I develop a comprehensive two-level contractarian theory that integrates traditional morality with instrumental morality. I argue that this theory, if implemented, is most promising for securing mutually beneficial peaceful long-term cooperation in deeply pluralistic societies, as compared to cooperation in a non-moralized state of nature. 2013. Politics, Philosophy and Economics 12 (1): 24-47. Harsanyi defends utilitarianism by means of an axiomatic proof and by what he calls the ‘equiprobability model’. Both justifications of utilitarianism aim to show that utilitarian ethics can be derived from Bayesian rationality and some weak moral constraints on the reasoning of rational agents. I argue that, from the perspective of Bayesian agents, one of these constraints, the impersonality constraint, is not weak at all if its meaning is made precise, and that generally, it even contradicts individual rational agency. Without the impersonality constraint, Harsanyi’s two justifications of utilitarianism on the grounds of Bayesian rationality fail. As an alternative, I develop a contractarian framework that is compatible with individual rational agency and Harsanyi’s central assumptions, and that allows the derivation of moral conclusions on the grounds of Bayesian rationality. The developed framework offers a novel justification of contractarian ethics and may best be described as a combined version of Harsanyi’s equiprobability model and Rawls’s original position. 2012. Philosophical Studies 158 (1): 83-107. In this article, I derive a weak version of Kant’s categorical imperative within an informal game-theoretic framework. More specifically, I argue that Hobbesian agents would choose what I call the weak principle of universalization, if they had to decide on a rule of conflict resolution in an idealized but empirically defensible hypothetical decision situation. The discussion clarifies (i) the rationality requirements imposed on agents, (ii) the empirical conditions assumed to warrant the conclusion, and (iii) the political institutions that are necessary to implement the derived principle. The analysis demonstrates the moral significance of the weak principle of universalization and its epistemic advantage over the categorical imperative. 2010. Utilitas 22 (4): 447-473. It is argued that the Nash bargaining solution cannot serve as a principle of distributive justice because (i) it cannot secure stable cooperation in repeated interactions and (ii) it cannot capture our moral intuitions concerning distributive questions. In this article, I propose a solution to the first problem by amending the Nash bargaining solution so that it can maintain stable cooperation among rational bargainers. I call the resulting principle the stabilized Nash bargaining solution. The principle defends justice in the form, ‘each according to her basic needs and above this level according to her relative bargaining power.’ In response to the second problem, I argue that the stabilized Nash bargaining solution can serve as a principle of distributive justice in certain situations where moral reasoning is reduced to instrumental reasoning. In particular, I argue that rational individuals would choose the stabilized Nash bargaining solution in Rawls’ original position. 2010. Encyclopedia of Political Theory, Vol 2, 946-951. SAGE Publications. The term neoclassical economics delineates a distinct and relatively homogenous school of thought in economic theory that became prominent in the late nineteenth century and that now dominates mainstream economics. The term was originally introduced by Thorstein Veblen to describe developments in the discipline (of which Veblen did not entirely approve) associated with the work of such figures as William Jevons, Carl Menger, and Leon Walras. The ambition of these figures, the first neoclassicists, was to formalize and mathematize the subject in the aftermath of the so-called marginalist revolution. Economics is, according to one definition, the science that studies human behavior as a relationship between ends and scarce means that have alternative uses. Neoclassical economics pursues this study by means of supply and demand models that determine prices based on the subjective preferences of producers and consumers. Neoclassical economics relies on subjective preferences for determining prices in order to escape from the so-called objective value theory of classical economics, according to which the value of goods could be established by reference to some basic commodity (usually corn) or the labor input required to produce a good. Neoclassicists hoped that by jettisoning objective value, economics could be placed on a more scientific basis as an essentially descriptive and predictive theory of human behavior. Political theory, by contrast, involves both positive and normative elements. It is a positive science to the extent to which it aims to describe and predict political behavior. It is a normative science to the extent to which it prescribes how agents should behave in the political arena and what the best political institutions are. Neoclassical economics is relevant to both of these elements. 2009. Journal of Global Ethics 5 (3): 195-214. Justice is important, but so is peaceful cooperation. In this article, I argue that if one takes seriously the autonomy of individuals and groups and the fact of moral pluralism, a just system of cooperation cannot guarantee peaceful cooperation in a pluralistic world. As a response to this consideration, I lay out a contractarian theory that can secure peace in a pluralistic world of autonomous agents, assuming that the agents who exist in this world expect that peaceful cooperation is the most beneficial form of interaction for them in the long run. The theory specifies the restrictions on the behavior of autonomous individual and collective agents that are indispensable for peaceful cooperation in a pluralistic world. In particular, I argue for the need of (i) a globally valid rule of conflict resolution to settle all intra- and inter-group conflicts that cannot be resolved locally, (ii) a world court to apply this rule in cases where local group authorities are inadequate to do so, and to serve as a final court of appeal, and (iii) a world police to enforce the rule. 2009. Utilitas 21 (3): 297-326. In this article, I argue that if one closely follows Hobbes’ line of reasoning in Leviathan, in particular his distinction between the second and the third law of nature, and the logic of his contractarian theory, then Hobbes’ state of nature is best translated into the language of game theory by an assurance game, and not by a one-shot or iterated prisoner’s dilemma game, nor by an assurance dilemma game. Further, I support Hobbes’ conclusion that the sovereign must always punish the Foole, and even exclude her from the cooperative framework or take her life, if she defects once society is established, which is best expressed in the language of game theory by a grim strategy. That is, compared to existing game-theoretic interpretations of Hobbes, I argue that the sovereign plays a grim strategy with the citizens once society is established, and not the individuals with one another in the state of nature.